Along with 6 other journalists I was invited by Ilaria Petitto to the Leopard at des Artistes for a Donnachiara Campania Wine Workshop. Ilaria is the 5th generation female to run the estate and is in charge of all operations. 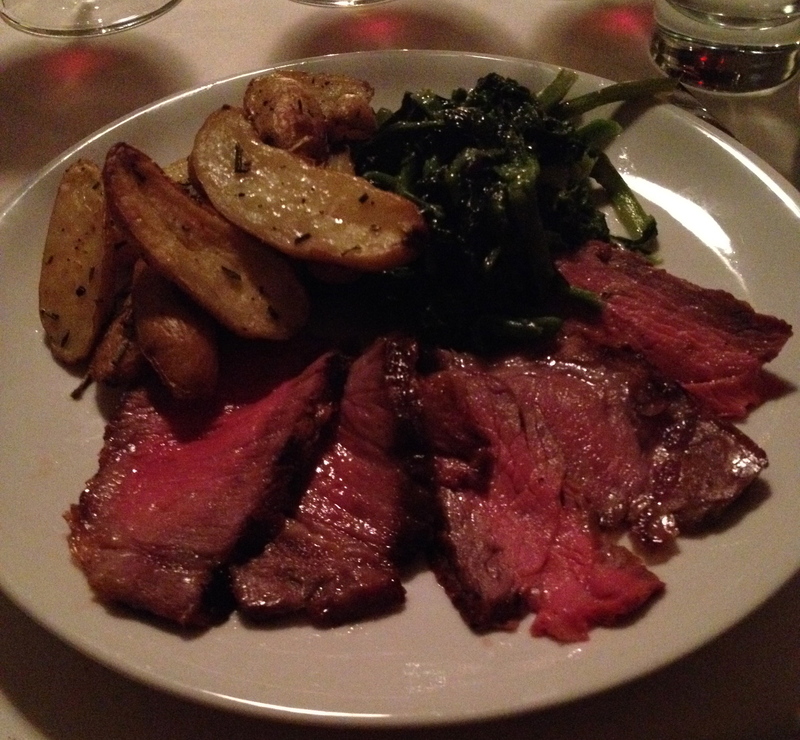 The workshop was held in the restaurant’s cozy private dining room. 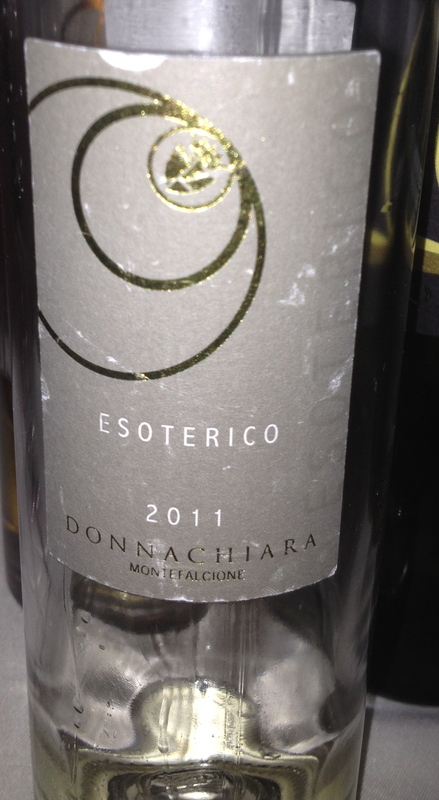 We tasted and drank the wines of Donnachiara and discussed the region of Campania and its wine. We spoke about what people think when the hear Campania: the Amalfi Coast, Naples, Pizza, Wine, etc., were cited. It was the consensus that Campania produces the best white wine in Southern Italy and certainly has the most interesting white grape varieties. The importance of the Aglianico grape and Taurasi was also discussed. Iliara then told us about the wines that she had chosen to match with the menu. Falanghina Beneventano Santè Brut IGT 100% Falanghina. Ilaria said that the vineyard is in Torre Cuso, the best location to grow Falanghina. The soil is volcanic chalky clay. There are 2,500 plants per hectare and the harvest takes place the first week of October. Fermentation lasts for 40 days. Illaria referred to the production method used as the Martinotti method for sparkling wine (The Charmat method, as it is more popularly known, was invented by Federico Martinotti in Asti in the 1920’s). Refermentation takes place at low temperatures in autoclaves for about 6 months. Then the wine matures on the dregs for another 2 months. The wine had very good bubbles; it was fresh, delicate with floral and citrus aromas and flavors. 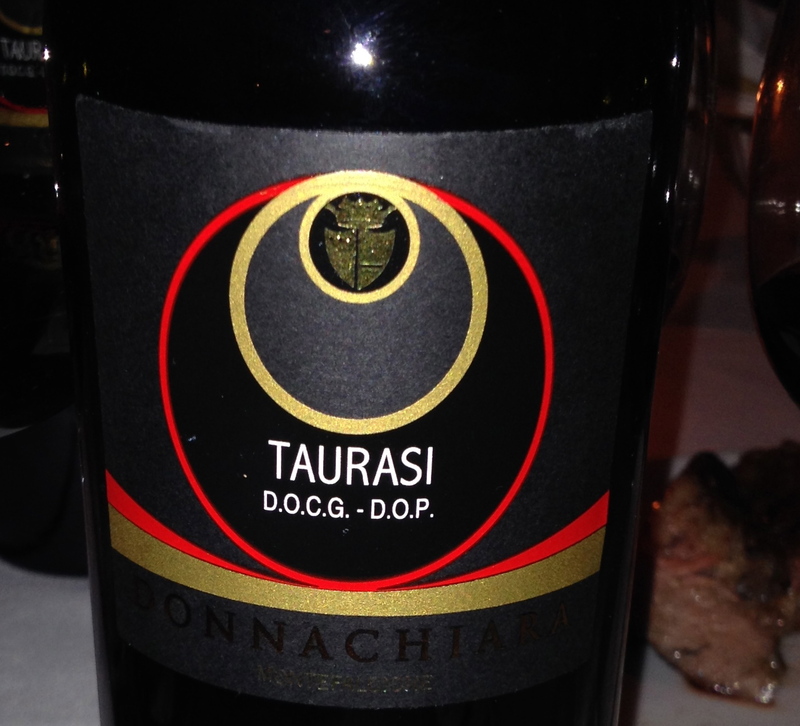 It was the perfect wine for the appetizers which were very much in the tradition of Campania. 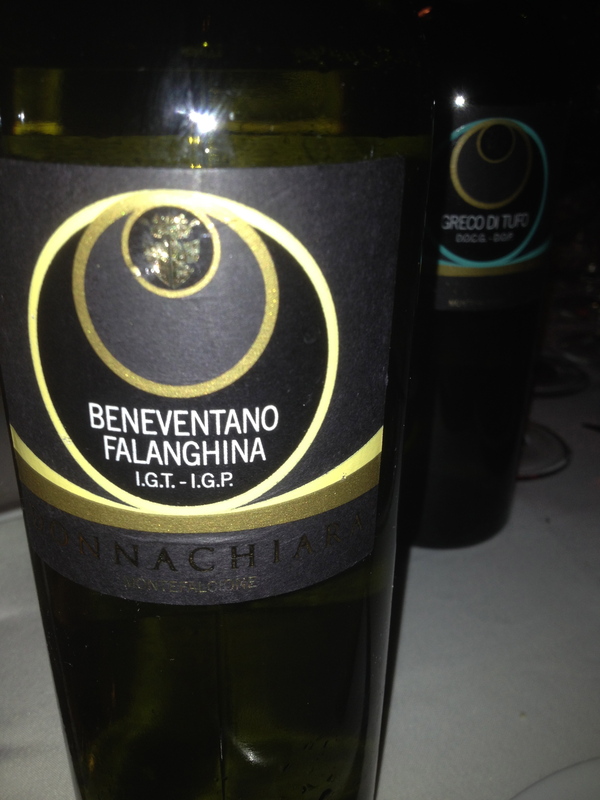 Falanghina Beneventano 2012 DOC 100% Falanghina the vineyard is the Torre Cuso, the best location for Falanghina. The soil is Volcanic, chalky clay, the vines are 16 years old , the training system is guyot and there are 2,500 vines per hectare. The grapes are not destemmed or crushed befor pressing. Cold fermentation is in stainless steel and there is extended maceration. 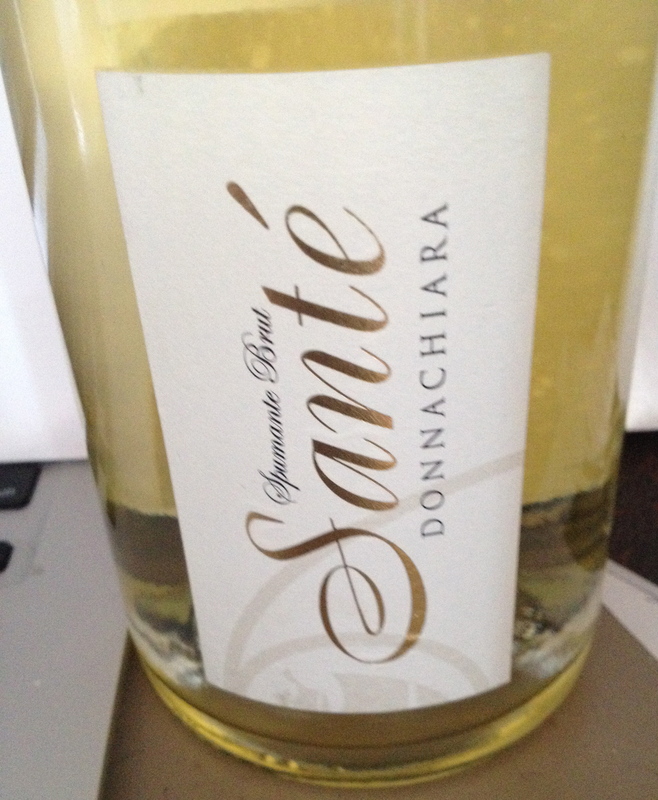 This is a crisp white wine with citrius fruit amomas and flavors nice acidity and good minerality. With the first two wines we had: crisp fried zeppole, potato croquettes known as panzerotti, miniature mozzarelle in carrozze and bite size pieces of torta Pasqualina, a spinach and ricotta pie. 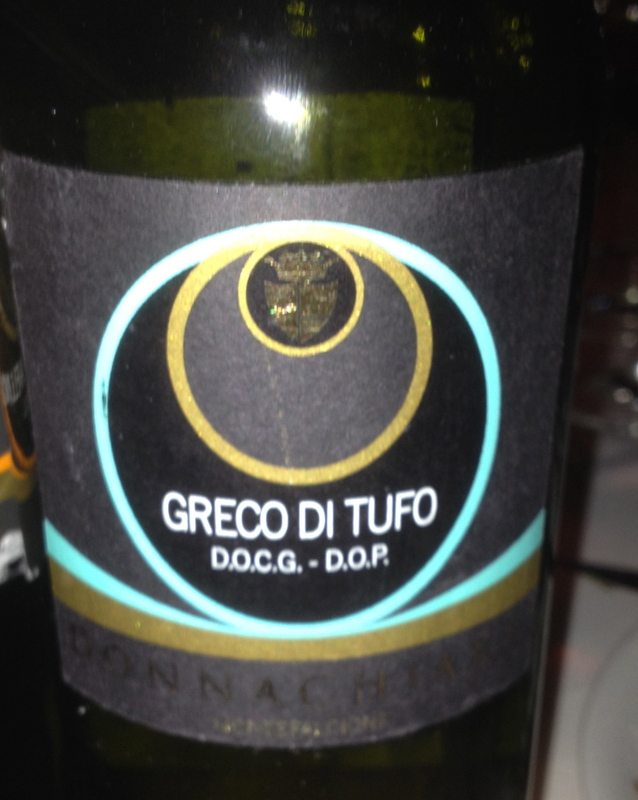 Greco di Tufo 2010 DOCG 100% Greco di Tufo The soil is tuffaceious and the training system is espallier. There are 3,300 plants per hectare and the harvest takes place during the second week of October. Illaria said that the grapes come from highly rated vineyards. The grapes are not destemmed or crushed prior to pressing. Cold fermentation with extended maceration. No oak used. This is a wine that needs at least 5 or 6 years of bottle age before it is ready to drink, she remarked. This was served with the Parmigiana di zucchine con scamorza e salsa al pomodoro and it was a perfect combination. The wine was just starting to come around, it has nice citrus aromas and flavors, a hint of smoke and a touch of almonds in the finish and aftertaste. 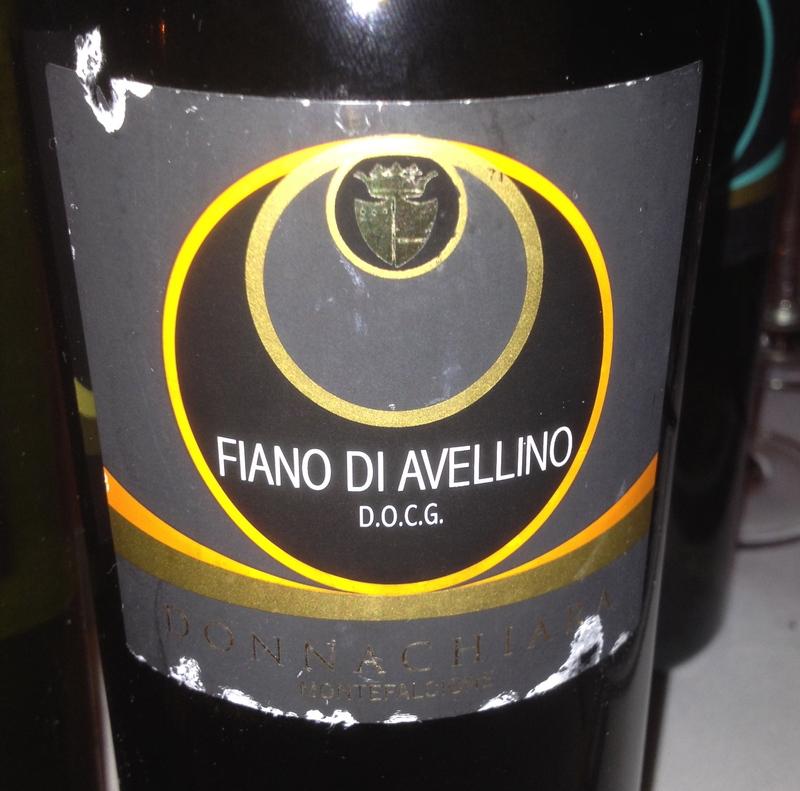 Fiano di Avellino DOCG 2007. 100% Fiano. The soil is chalky clay and the training system is Guyot. There are 4,400 vines per hectare and the 4 hectare vineyard is located at 600 meters. Harvesting takes place during the second week of October. llaria said that 2007 was a very hot and dry vintage that produced a very concentrated wine with scents ranging from candied fruits to flora. She believes the aging potential of the wine is 15/20 years and I agree. This is a wine with good structure and body. There were floral notes, aromas and flavors of citrus fruits, good acidity and a hint of smoke. This was an excellent compliment to the Scialatielli ai frutti di mare, short strips of homemade pasta typical of Amalfi in a seafood and tomato sauce. Greco di Tufo IGT Ostinato Campania 2011 100% Greco. This single vineyard is 4 hectares and it is outside the DOCG zone in Venticano, Torre Le Nocella. The soil is clay and limestone. The age of the vines is 20 years, the training system is Guyot and there are 5,000 plants per hectare. A late harvest takes place the first half of November. The grapes are not destemmed or crushed prior to pressing. Fermentation is for 12 months 20% of which is in French barriques. The wine is naturally clarified and there is no refrigeration or filtration at bottling. The first time I drank this wine I had it with pasta and clams and it was a terrible combination. The label said Greco di Tufo, but it tasted like a dessert wine. At the workshop dinner, it was served with crostino di pane ciabatta con fegato grasso, toasted ciabatta bread with foie gras. The combination was sensational, since like certain dessert wines, it goes well with foods like foie gras or cheese. I told Ilaria that I found this wine to be very confusing since there is no indication on the bottle that it is a dessert wine. She said that it is in a smaller bottle (500ml), the bottle is clear so you can see the darker color. I said that this should be clarified on the label for the sake of the consumer. It becomes even more confusing because of the next wine, the Esoterico Campania Fiano 2011 IGT 100% Fiano. The soil is volcanic, chalky clay, the age of the vines is 6 years, the training system is Guyot and there are 4,400 vines per hectare. Everything else is done just like the Greco except the final result is different. The wine is light in color and while it has more body than the regular Fiano, it does not really taste like a dessert wine. I would not drink it with fegato grasso. Taurasi DOCG 2007, 2008 and 2009. 100% Aglianico coming from the 20 hectare estate vineyard Torre le Nocelle. Ilaria said that all of Donnachiara’s red wines are made from grapes from this vineyard. The soil is volcanic, the vines are 30 years old, the training system is Guyot and there are 4,000 plants per hectare. The grapes are not destemmed or crushed prior to pressing and there is no filtration. The wine is aged for 12 months in 225-liter French barriques. I find these red wines to be more modern in style but not over the top and they all needed more time. Two lucky men. Illaria is wonderful as are her wines.